Do you have a girl who likes pink? Or shoes? Or both? 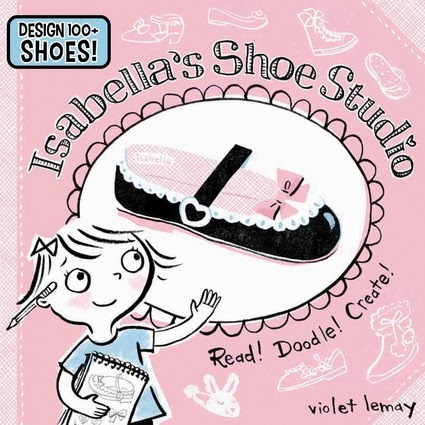 If she's a fan of doodling as well, then Isabella's Shoe Studio is likely to be a sure fire hit! This doubles as a storybook and a doodle book. So read along with a set of your favorite drawing utensils in hand. Isabella loves to create things. She is eight years, seven months, three weeks, and four days old. When she grows up, she wants to create SHOES! Her mother and grandmother are also in the fashion industry. Her Nana makes beautiful dresses and her mother makes gorgeous hats. Isabella likes drawing hats and dresses but, as the title and I have already declared, her passion is shoes. She thinks about shoes, dreams about shoes and can't refrain from drawing pictures of them. Despite what it may sound like, Isabella's Shoe Studio doesn't come across as being prissy or snobby at all. I think Isabella is a remarkably nice character whose appearance reflects a simple innocence that I'd like to see more of in the fashion world. Although the topic and activities in this book would lean one towards the idea that appearances are important and what you wear is everything, I didn't walk away with that impression. Isabella is a very kind and simple girl who encourages the reader to enjoy their own efforts at creativity as they read along. The readers/artists who pick up this book are encouraged to complete pictures and also design their own creations within these pages. They are invited to make their own hats, draw pictures of their families, and then, of course, design shoes. There are pages to create sweet and funny baby shoes, shoes for parties, shoes for stomping in the rain, for being elegant in, and for having fun with. I have a little girl myself who I think is well on her way to being able to enjoy a book like this. She's a bit young for it at present so I'll set it aside until she can use it appropriately. I think this title is most excellent for ages 7 and up. If you do know of a little girl who you think might enjoy this book, I have some fun news! Duopress has offered to give away one copy of this book to one of you! Care to win? Simply leave a comment below (including a valid e-mail address). This contest is open to U.S. Residents only and will be open through Tuesday, November 19th. THIS CONTEST IS NOW CLOSED. THE WINNER, as selected by Random.org, is #6 - Susan Squires. Congrats! Many thanks to duopress for sending a copy of the book my direction in order to facilitate my review. I received no additional compensation for this post and, as always, all opinions are entirely my own! My Louise would enjoy this! I do think my M would fit this bill. Sweet! Sounds like a wonderful gift for any girl! Thanks! Oh, my niece would love this!